UFO SIGHTINGS DAILY: Yin-Yang Symbol Found On Saturn Moon Iapetus, March 2016, UFO Sighting News. 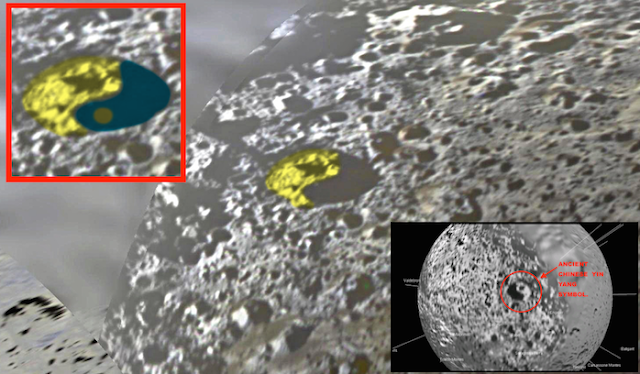 Yin-Yang Symbol Found On Saturn Moon Iapetus, March 2016, UFO Sighting News. While looking over some NASA photos of Saturns moon Iapetus, I found an only Yin-yang symbol that I had found back in 2012, but have never seen it since. I assumed that NASA had blurred out everything, but was lucky to find it again in a new photo. The symbols exact location is between Engelier crater and Geboin. Have you noticed that even in newer photos, NASA still passes off full scale photo maps with 80% of it purposely blurred? And 90% of the public ignores it. Enlarge it to see for yourself. Mark my words, there will come a time when we the public will go before the UN and demand they force NASA to reveal the true photos, without blur. Its going to happen, even if I'm the one that will have to make it so. Time...is not on NASAs side.